Objective To investigate whether funding of drug studies by the pharmaceutical industry is associated with outcomes that are favourable to the funder and whether the methods of trials funded by pharmaceutical companies differ from the methods in trials with other sources of support. Methods Medline (January 1966 to December 2002) and Embase (January 1980 to December 2002) searches were supplemented with material identified in the references and in the authors' personal files. Data were independently abstracted by three of the authors and disagreements were resolved by consensus. Results 30 studies were included. Research funded by drug companies was less likely to be published than research funded by other sources. Studies sponsored by pharmaceutical companies were more likely to have outcomes favouring the sponsor than were studies with other sponsors (odds ratio 4.05; 95% confidence interval 2.98 to 5.51; 18 comparisons). None of the 13 studies that analysed methods reported that studies funded by industry was of poorer quality. Conclusion Systematic bias favours products which are made by the company funding the research. Explanations include the selection of an inappropriate comparator to the product being investigated and publication bias. A recent systematic review of the impact of financial conflicts on biomedical research found that studies financed by industry, although as rigorous as other studies, always found outcomes favourable to the sponsoring company.8 However, this review looked for papers published only in English, excluded reports in letters and abstracts, and looked at studies funded by other industries. We reviewed the relation between the source of funding of the research and the reported outcomes and investigated whether quality of the methods in studies funded by pharmaceutical companies differs from that in other studies. We included only studies that specifically stated that they analysed research sponsored by a pharmaceutical company, compared methodological quality or outcomes with studies with other sources of funding, and reported the results in quantitative terms. Outcomes of interest were conclusions about differences in drug effectiveness, adverse effects, cost outcomes, or publication status between industry funded trials and other trials. Work published in any language was eligible for inclusion. Some studies analysed both pharmacological and non-pharmacological trials and combined research funded by drug companies and other industries into one group. In these cases, if most were non-pharmaceutical trials and were funded by other industries they were excluded. We searched Medline from January 1966 to December 2002 using a combination of terms as both MESH subject headings (exploded) and key words (“clinical trials,” “conflict of interest,” “drug industry,” “financial support,” “publication bias” (subject heading only), “research design,” and “research support.”) We searched Embase from January 1980 to December 2002 using a combination of terms as subject headings (exploded) and key words (“clinical trials” (subject heading only), “drug industry,” “ethics,” “financial management,” “methodology,” and “ethics.” To find more studies, we scanned the reference lists from each of the articles and searched the Cochrane methodology register. We placed messages on two email drug discussion groups, contacted content experts, and searched our personal libraries. In cases where the reported results were incomplete, we contacted the lead author and asked for further details. A single author (JL) did the initial selection of studies and sent copies of each of these studies to the other three authors for validation of the inclusion criteria. From each study, we extracted the study design, type of research assessed in the study, design of research assessed in the study, search strategy used to locate research, time period covered, drug or drug class, disease, number of industry and non-industry funded articles analysed in each study, how industry funding was defined, criteria used to assess methodological quality of the research, results with respect to methodological quality or outcome of the research, and primary purpose of study. Three of us (LB, OC, JL), who were not blinded to study authors or results, independently abstracted information. We resolved disagreements by consensus. On the basis of the rationale that funding does affect the direction of effect, we did a meta-analysis on the studies that reported the effects of funding on the outcome of either pharmacoeconomic analyses or clinical trials in cases where odds ratios could be computed. The homogeneity test showed that the effect size did not differ between the studies (P=0.17). Using a Mantel-Haenszel test, we constructed a pooled odds ratio.11 We used the program StatsDirect and considered P < 0.05 significant. The combined searches and other data sources found 3351 potential titles. We scanned titles and abstracts (where available) for mention of the pharmaceutical industry in either the title or the abstract or any suggestion that the study would deal with industry funding. We read 103 articles in full (eight in languages other than English); we retained 30 articles for analysis. Reasons for exclusion are detailed in the QUOROM statement (fig 1). The studies by Friedberg et al23 and by Knox et al29 analysed the same set of 44 trials but looked at different aspects of the trials: conclusions about the usefulness of products in one case,23 and how the trials had been reported in the other.29 Only one article was duplicated in the two studies reported by the group including Chard, Tallon, and Dieppe13 18 (J Chard, personal communication, 2002). Seven of the nine articles in Kemmeren's27 meta-analysis of third generation oral contraceptives were also included in Vandenbroucke's meta-analysis.39 We found no other cases of double counting, but as some of the papers did not provide a full list of references we could not exclude the possibility of further overlap. Figure 2 shows the individual odds ratios and summary odds ratio for 18 different comparisons (15 studies) of the outcomes of industry funded and non-industry funded studies—seven from pharmacoeconomic analyses and 11 from clinical trials or meta-analyses of clinical trials. The summary odds ratio was 4.05 (95% confidence interval 2.98 to 5.51). Research sponsored by the drug industry was more likely to produce results favouring the product made by the company sponsoring the research than studies funded by other sources. The results apply across a wide range of disease states, drugs, and drug classes, over at least two decades and regardless of the type of research being assessed—pharmacoeconomic studies, clinical trials, or meta-analyses of clinical trials. The totality of the evidence reported in our meta-analysis of a subset of homogeneous studies suggests that there is some kind of systematic bias to the outcome of published research funded by the pharmaceutical industry. Our results confirm and extend those reported by Bekelman et al.8 They identified only five studies that compared outcomes in research funded by pharmaceutical companies and other sources,14 16 20 23 41 and our study adds another 16 studies12 13 15 18 19 22 24 26 27 30 32 34 36 38–40 Our results are also supported by Rochon and coworkers43 (we excluded this paper because all of the trials were sponsored by drug companies and were, therefore, not comparible with trials lacking company funding.) They found that trials supported by manufacturers of non-steroidal anti-inflammatory agents almost always reported that the sponsor's drug was as or more effective and less toxic than the comparison drug. Thirdly, selecting an appropriate comparator is a key issue in planning a clinical trial.7 20 44 In the study by Rochon et al, in most cases in which the doses of the study and comparator drugs were not equivalent, the drug given at the higher dose was that of the supporting manufacturer.43 As the authors saw, higher doses may bias the results in favour of effectiveness of the manufacturer's product. Safer also reports that in trials of psychiatric drugs the comparator drug is often given in doses outside the usual range or there is a rapid and substantial dose increase in the drug not manufactured by the sponsoring company.48 In another instance, research funded by the company marketing fluconazole compared it with oral amphotericin B, a drug known to be poorly absorbed, thereby creating a bias in favour of fluconazole.49 We did not consider who is finally responsible for the selection of the comparator—investigators, regulatory agencies, or sponsors. Methods in studies sponsored by industry were at least as good as in studies with other sources of funding. Conclusions about overall quality can be influenced by the instrument used,9 and some of the scales may have missed important criteria. Leading medical journals recently decided to establish more rigorous criteria for the acceptance of research sponsored by industry; this is a step in the right direction towards increasing the credibility of studies paid for by drug companies.58 The revised CONSORT statement should also help improve the quality of clinical research.59 60 In addition, authors and editors should consider including a statement concerning prior beliefs of the investigators about the uncertainty of the treatments that are reported. Finally, all clinical trials should be registered prospectively as the only way to prevent publication bias.61 The proposal to do so which was put forward in 198662 has been periodically renewed,63–65 but to this date has not been implemented. We thank Jiri Chard, David Liebeskind, Paula Rochon, and José Sacristan for additional information and data about their studies. Contributors: JL conceived and planned the study, did the Medline search, extracted the data, and wrote the paper. LAB planned the study, extracted the data, and wrote the paper. BD planned the study, checked the data extraction process, and wrote the paper. OC extracted the data and wrote the paper. JL is guarantor. Competing interests BD has been funded by several pharmaceutical companies to perform research and has received speaking honorariums.
. Use and sources of medical knowledge. Lancet 1991; 338: 1368–73.
. Secular changes in published clinical trials of second-line agents in rheumatoid arthritis. Arthritis Rheum 1991; 34: 1304–9.
. Reports of randomized trials in acute stroke, 1955 to 1995: what proportions were commercially sponsored? Stroke 1999; 30: 1995–8.
. 2001 industry profile. Washington, DC: PhRMA, 2003. http://www.phrma.org/publications/publications/profile02/index.cfm (accessed 6 May 2003).
. Using economic evaluations to make formulary coverage decisions: so much for guidelines. Pharmacoeconomics 2000; 18: 55–62.
. Problems with the interpretation of pharmacoeconomic analyses: a review of submissions to the Australian Pharmaceutical Benefits Scheme. JAMA 2000; 283: 2116–21.
. Influences on the quality of published drug studies. Int J Tech Assess Health Care 1996; 12: 209–37.
. Scope and impact of financial conflicts of interest in biomedical research: a systematic review. JAMA 2003; 289: 454–65.
. The hazards of scoring the quality of clinical trials for meta-analysis. JAMA 1999; 282: 1054–60.
. Measuring the quality of trials: the quality of quality scales. JAMA 1999; 282: 1083–5.
. Epidemiology in medicine. Boston: Little, Brown, and Company, 1987.
. The effectiveness of cost-effectiveness analysis in containing costs. J Gen Intern Med 1998; 13: 664–9.
. Epidemiology of research into interventions for the treatment of osteoarthritis of the knee joint. Ann Rheum Dis 2000; 59: 414–8.
. The quality of drug studies published in symposium proceedings. Ann Intern Med 1996; 124: 485–9.
. Funding source, trial outcome and reporting quality: are they related? Results of a pilot study.
. Source of funding and outcome of clinical trials. J Gen Intern Med 1986; 1: 155–8.
. Factors influencing publication of research results: follow-up of applications submitted to two institutional review boards. JAMA 1992; 267: 374–8.
. Funding clinical research. Lancet 1999; 353: 1626.
. Violation of the uncertainty principle in conduct of randomized controlled trials (RCTs) of erythropoietin (EPO). Blood 1999; 94(suppl 1):399A.
. The uncertainty principle and industry-sponsored research. Lancet 2000; 356: 635–8.
. Publication bias in clinical research. Lancet 1991; 337: 867–72.
. Predictive value of pharmacological activity for the relative efficacy of antidepressant drugs: meta-regression analysis. Br J Psychiatr 2000; 177: 292–302.
. Evaluation of conflict of interest in economic analyses of new drugs used in oncology. JAMA 1999; 282: 1453–7.
. Effect of the statistical significance of results on the time to completion and publication of randomized efficacy trials. JAMA 1998; 279: 281–6.
. 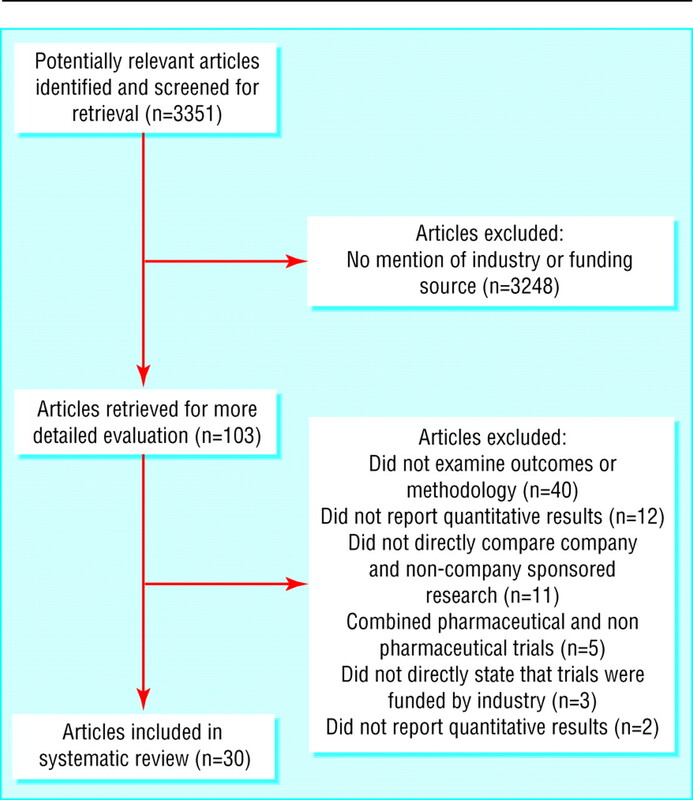 Systematic reviews and meta-analyses on treatment of asthma: critical evaluation. BMJ 2000; 320: 537–40.
. Economic analyses of respiratory syncytial virus immunoprophylaxis in high-risk infants. Arch Pediatr Adolesc Med 2002; 156: 1034–41.
. Third generation oral contraceptives and risk of venous thrombosis: meta-analysis. BMJ 2001; 323: 1–9.
. Randomized clinical trials in Hepatology: predictors of quality. Hepatology 1999; 30: 1134–8.
. Reporting and dissemination of industry versus non-profit sponsored economic analyses of six novel drugs used in oncology. Ann Oncol 2000; 11: 1591–5.
. Meta-analysis of tacrine for Alzheimer Disease: the influence of industry sponsors. JAMA 1999; 281: 2287.
. Empiric evidence of publication bias affecting acute stroke clinical trials. Stroke 1999; 30: 268.
. Manufacturer support and outcome. J Clin Psychiatry 1999; 60: 122–3.
. Publication of sponsored symposiums in medical journals. N Engl J Med 1993; 328: 1196–7.
. Are pharmaceuticals cost-effective? A review of the evidence. Health Affairs 2000; 19(2): 92–109.
. Evaluating the quality of articles published in journal supplements compared with the quality of those published in the parent journal. JAMA 1994; 272: 108–113.
. 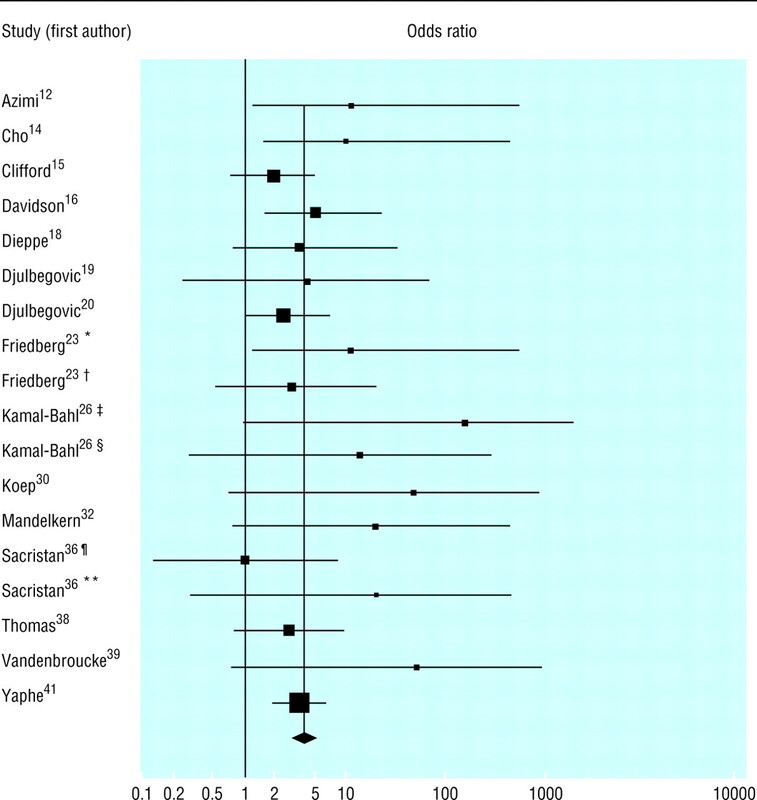 Publication bias in health economic studies. Pharmacoeconomics 1997; 11: 289–91.
. Publication bias: evidence of delayed publication in a cohort study of clinical research projects. BMJ 1997; 315: 640–5.
. Sponsorship, authorship, and accountability. Lancet 2002; 359: 351.
. Competing interests and controversy about third generation oral contraceptives. BMJ 2000; 320: 381–2.
. Sponsored drug trials show more-favourable outcomes. BMJ 1999; 318: 465.
. The association between funding by commercial interests and study outcome in randomized controlled drug trials. Family Practice 2001; 18: 565–8.
. Impact of pharmaceutical industry funding of clinical research: results of a survey of antianginal trials. Circulation 1984; 70(suppl II):390S.
. A study of manufacturer-supported trials of nonsteroidal anti-inflammatory drugs in the treatment of arthritis. Arch Intern Med 1994; 154: 157–63.
. Acknowledgment of uncertainty: a fundamental means to ensure scientific and ethical validity in clinical research. Cur Oncol Rep 2001; 3: 389–95.
. Assessing the quality of reports of randomized trials: implications for the conduct of meta-analyses. Health Technol Assess 1999; 3(12): 1–90.
. Does quality of reports of randomized trials affect estimates of intervention efficacy reported in meta-analysis? Lancet 1998; 352: 609–13.
. Methodology and overt and hidden bias in reports of 196 double-blind trials of nonsteroidal antiinflammatory drugs in rheumatoid arthritis. Control Clin Trials 1989; 10: 31–56.
. Design and reporting modifications in industry-sponsored comparative psychopharmacology trials. J Nerv Ment Dis 2002; 190: 583–92.
. Problems in the design and reporting of trials of antifungal agents encountered during meta-analysis. JAMA 1999; 282: 1752–9.
. Thyroid storm. JAMA 1997; 277: 1238–43.
. Academia and industry: lessons from the unfortunate events in Toronto. Lancet 1999; 353: 771–2.
. Company sought to block paper's publication. Lancet 2000; 356: 1659.
. The publication of sponsored symposiums in medical journals. N Engl J Med 1992; 327: 1135–40.
. Meta-analysis of tacrine for Alzheimer Disease: the influence of industry sponsors. JAMA 1999; 281: 2287–8.
. Sponsored trials do not necessarily give more-favourable results. BMJ 1999; 318: 1762.
. Relation between agendas of the research community and the research consumer. Lancet 2000; 355: 2037–40.
. Redundancy, disaggregation, and the integrity of medical research. Lancet 1996; 347: 1024–6.
. Sponsorship, authorship, and accountability. N Engl J Med 2001; 345: 825–6.
. The revised CONSORT statement: explanation and elaboration. Ann Intern Med 2001; 134: 663–94.
. The CONSORT statement: revised recommendations for improving the quality of reports of parallel-group randomized trials. JAMA 2001; 285: 1987–91.
. Time to register randomized trials. Lancet 1999; 354: 1138–9.
. Publication bias: the case for an international registry of clinical trials. J Clin Oncol 1986; 4: 1529–41.
. Toward prospective registration of clinical trials. Control Clin Trials 1988; 9: 1–5.
. Underreporting research is scientific misconduct. JAMA 1990; 263: 1405–8.
. The time to register randomized trials. BMJ 1999; 319: 865–6.